Support a local tourism icon and get friendly with Portland Cable Trams! 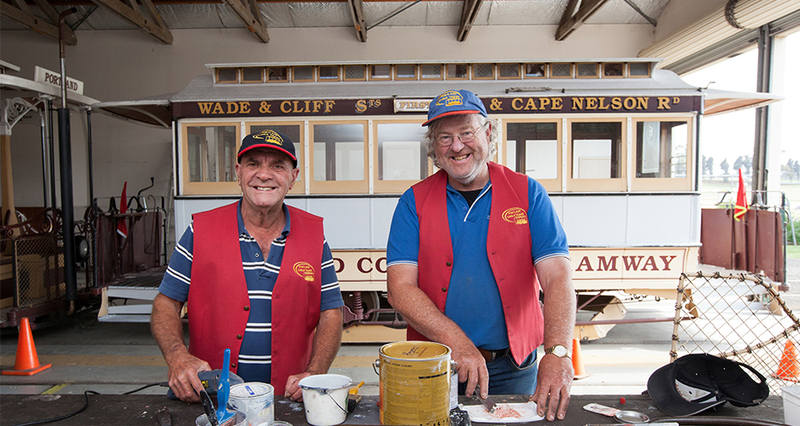 Local residents are being urged to hop aboard the historic Portland Cable Trams to support a local icon this summer. The attraction has relaunched its ‘Friends of the Portland Cable Trams’ program, giving locals the opportunity to ride free all year round. Portland Cable Trams Manager, Joy Hocken, said the special membership aimed to build a loyal base of supporters for the daily tram service. “People who buy a ‘Friends’ membership can ride free for a whole year,” she said. Ms Hocken said the 7.4-kilometre tram circuit offered beautiful views over the working port, providing a fresh perspective of the township. The Portland Cable Trams journey begins at the tram depot and museum at 2A Bentinck Street, or any of the tram stops along the route, including the Portland Powerhouse Museum, the World War Two museum and lookout, the Portland Maritime Discovery Centre and Botanic Gardens. Ms Hocken said the tram ride included commentary from passionate and knowledgeable local volunteers about the history of Portland and other points of interest. “The support we receive from our volunteers and the local community really is wonderful – without it, we would be much the poorer,” she said. An annual Friends of PCT membership costs $15 for individuals or $35 for a family, and includes a special commemorative ticket. For details, phone Portland Cable Trams on 03 5523 2831 or drop into the Depot at 2A Bentinck Street, Portland.